Since the aerial surfaces of land plants are in direct contact with atmosphere they face the problem of evaporation, which may lead to death because of dehydration. To overcome this problem their aerial surfaces are covered with thick cuticle. But the cuticle blocks exchange of essential gases, the oxygen and carbon dioxide. To facilitate exchange of gases the epidermis is provided with minute pores, the stomatal pores, however these pores also promote transpiration. It has been observed that these pores are ideally adapted for conditions are suitable for photosynthesis and close during night when photosynthesis is not taking place. The loss of water is regulated by stomata and it depends much on opening and closing of stomata. It has been observed that rate of transpiration is higher when the stomata are open and it is reduced when the stomata are closed. It has also been observed that when the water in soil is depleted but enough sunlight is there, the stomata open less or even remain close to prevent loss of water. Stomata are minute, elliptical or elongated slit-like pores (stomatal pores) in the epidermis surrounded by kidney-shaped or dumbell-shaped guard cells. In monocots and few dicots the guard cells are surrounded by specialized subsidiary cells which differ from epidermal cells. The subsidiary cells help guard cells in opening and closing. The stomatal pores, guard cells and subsidiary cells are collectively termed stomatal apparatus or stomata complex. The guard cells has usually thick walls compared to other leaf cells. The ventral wall (adjacent to stomatal pores) is more thickened as compared to dorsal wall (in contact with epidermal cells). The thinking is due to the cellulose microfibrils in the guard cells and help in opening and closing of stomata. Kidney shaped guard cell the cellulose microfibrils fan out radially from pores, thus the cell girth is reinforced like a steel belted tire, and the guard cells curve out to widen the stomatal pore. On the other hand, the inflatable bulbous ends of dumbell shaped guard cells swell and increase in volume as a result the beams are separated from each other and the slit between them widens. The guard cells are uninucleate, contain small vacuoles and few chloroplasts in which only light phase of photosynthesis occurs. a German botanists proposed that turgor changes in guard cells provide the driving force for the stomatal movement. The stomata open when the guard cells take up water and become turgid and close when they loose water and become flaccid. 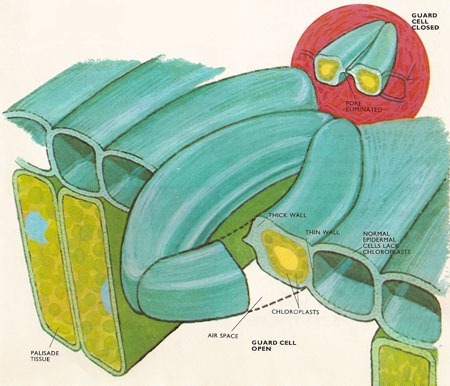 The entry of water into the vacuoles of guard cells result in development of turgor pressure within these cells which causes changes in the orientation of cellulose microfibrils of the cell walls. The volume an shape of the guard cell changes and size of the stomatal pore increases. The exit of water from the guard cell changes result in lowering of the turgor pressure resulting in reorientation of cellulose microfibrils and decreases in size of the stomatal pore. 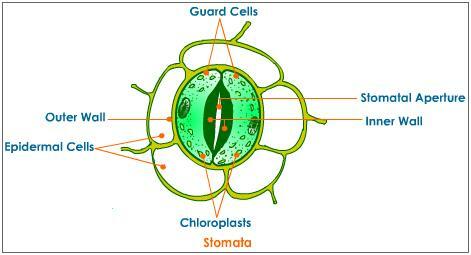 Thus, opening and closing of stomata depends upon changes in turgor of the guard cells. There are two possibilities that can explain movement of water into the guard cells. First increase in osmotic potential o the guard cell protoplast than the surrounding cells causing decrease in water potential of the guard cells and inward movement of the water by osmosis. The decrease in resistance of the guard cell wall to stretching, decreasing the pressure inside the cell and allowing the inward movement of water. Measurement of osmotic potential of guard cells have shown that the osmotic potential becomes more negative when the stomata open and less negative when close. Thus, first possibility seems to be more plausible.